have a lower proportion/total amount of carb (bulky green vegetables fill you up but have a low carb density so visually they will take up much more room on your plate than your protein source) than traditional meals – except for a handful (like those with pitta bread) which you can occasionally eat as part of a ‘normal’ diet when you’ve reached your weight goal. how quickly it’s being taken out of the blood by your muscles – which depends on how exhausted i.e. depleted of glycogen they are. Of course, you’ll probably break the principles from time-to-time e.g. when socializing (even then your body probably won’t want to gorge anyway if you’ve kept it well nourished) or when pressure of work means you don’t have time to cook but if you follow the principles you’ve discovered the large majority of the time and continue to monitor your weight don’t worry about it! The Secret of How to Lose Fat! 1) I changed WHAT I ate to stomach-filling meals with a much lower amount of carbohydrate (90 grams total per day is fine if you have a fairly sedentary lifestyle but go as low as you can comfortably manage while ensuring you get enough fibre in your diet – read the grams of carb on the nutrition label on your foods or google their ingredients e.g. here) combined in the meal in a low-GI way (see the videos here if you don’t know what GI means) while at the same time ensuring I got essential nutrients (proteins, vitamins, minerals, essential fats, fibre) so my body was not denied what it NEEDED and my blood sugar was kept at an even level (rapid rises in blood sugar are always followed by rapid drops – which make you feel incredibly hungry!). 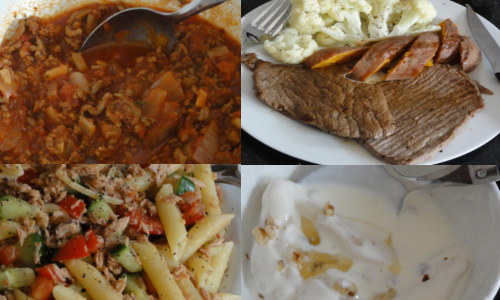 I gradually learnt about the calories in various foods and limited my food intake so I ate 1000 fewer calories than my body was using per day (to lose around 1kg a week). I came up with a list of meals I liked that both satisfied my cravings for specific tastes, textures and smells like spicy, savoury, sweet, chocolaty, acidic, tart, crunchy, nutty, meaty, cheesy, chewy, creamy, aromatic but ALSO met my lower carb/high nutrient criteria and then shopped for those meal ingredients only, preparing batches of the cooked meals in advance (that I stored in my freezer) – I’ve posted pictures of the staple meals/snack ‘faithfuls’ I settled on (including a Slim-Fast style meal replacement milk shake) in the Recipes section. A strategy I found useful was to eat the majority of ‘feel-good’ carbohydrates in a pudding (like this) after the main meal – that way I finished the meal on a carb high feeling completely satisfied but without having consumed too many in total. I took a cheap supermarket-branded multivitamin and mineral tablet daily to ensure I got the nutrients I needed on my calorie-limited diet and made sure my diet included foods containing Omega 3, 6 and 9 fatty acids. What you give your body is as important as what you deny it but I reduced saturated fats, eliminated products with artificial sweeteners (which stimulate appetite) and caffeine (which causes water and minerals to be lost from the body), drinking water or green/herbal tea (without sugar) when thirsty – note that you will feel more thirsty and need to drink more as you start to burn your fat reserves. Remember, you will eat a smaller quantity of food but once you get over your sugar cravings (which can last for a few days) your body will quickly adapt to burning fat when it needs energy and re-educate your body’s cravings for the healthier foods you have introduced into your diet – if you only source of XYZ vitamin or mineral is French fries then you will crave French fries; when your body has healthier food sources of the nutrients it needs it will actually crave those healthy sources and you will come to love several foods you didn’t before! 2) I changed WHEN I ate to (a) include a breakfast and (b) rarely eat anything substantial later than 8pm so I didn’t go to sleep on a full stomach and had a restful night’s sleep. I also only ate at a meal time or when I was really feeling hungry in my stomach – rather than when I wanted a food ‘high’/’hit’ to cheer me up because I felt stressed or down or tired or bored or wanted a pleasurable distraction giving life a purpose/goal. Distinguishing real hunger from thirst (dehydration) or just feeling low in mood/energy is a skill that can be developed fairly quickly by allowing yourself to drink water/unsweetened tea or eat a limited repertoire (like apples, low-carb-density vegetables and canned tuna) of nutritious but not highly pleasurable foods when feeling the urge to eat. I never starved myself and always allowed myself to eat one of my repertoire of nutritious but not highly pleasurable foods if feeling truly hungry between meals. By BALANCING your energy intake (how much you eat and when) against your energy expenditure (how active you are) before and after that intake you can ‘coast’ along at a comfortable medium-to-low (but not so low that you feel hungry and end up over-eating) blood sugar level and get your body to burn fat by doing nothing – even when you sleep! In fact, the easiest time to deal with low blood sugar is at night while you’re sleeping since your body ordinarily burns fat then anyway and you don’t feel hungry at all. Modern work life can be stressful but if you allow yourself the time to savour tastes on your palate and take at least 30 minutes over your main meal of the day from the first bite to the last your stomach will have time to register how full you are and you’ll naturally know when you’ve had enough to eat. Listen to your body (but not false hunger cravings) and eat until you are satisfied. Remember that whatever you do during your weight loss phase has to also be manageable comfortably long term – there is no point exerting lots of willpower to deny your body’s real hunger cravings since you will just end up compensating (and more) down the line. 3) I kept a weekly record of my weight and fat % (using a set of electronic scales) and took weekly photos of my body to monitor my PROGRESS. Seeing the results gave me feedback on how various foods impacted my weight loss and looking more conventionally attractive and feeling healthier motivated me to continue losing weight. Muscle in fact weighs more than fat and your weight can change by 3kg from one day to the next depending on your intestine contents and level of hydration so recording fat % and pictures of your muscle tone is vital to know how amazingly well you’re doing! 4) I did 1 minute (yes, that’s not a typo!) of INTENSE (heart rate up to 120bpm) exercise a day on 3 alternate days a WEEK – as 3 bursts of 20 seconds of intense running on the spot (or cycling or swimming) every Monday, Wednesday and Friday. The effects of this small amount of exercise on your blood biochemistry are profound and extend well into the next day. Prior to my new lifestyle (it’s now a way of life I enjoy rather than a temporary regime of denial) I had in the main eaten foods I mistakenly thought were healthy and good for weight loss (like brown bread, wild rice, baked potatoes, cereals) together with convenient supermarket ready-meals (lasagne, fish pie, curry, M&S ‘fuller for longer’ meals) and in fact spent more time exercising (though at a lower pace). I had also dieted from time to time in the past when I felt the waistline had gone too far but always ended up putting the lost weight back on. This is a lot of information to take in presented in a condensed way but my hope is that this site will provide you with a sufficient understanding of nutrition and your body’s biochemistry to enable you to implement the lifestyle changes that will let you take charge of your weight and stay healthy throughout your life – as well as pass on the understanding you develop and good habits you learn to those you care about. If you have questions not answered here then do please ask/comment. Some people find it easier to be given a more prescriptive approach to what to do when starting out – a kind of one-size-fits-all template – and I have provided such a ‘prescription’ here, however, it’s important that as you see positive results you understand why the regime works so you can continue to lead a healthy lifestyle and keep your weight at a healthy level forever. Find someone near you to chow down with! If you’ve read the tips section, begun to practice them by following the lifestyle and recipes and been overjoyed with your results you may, like me, have come to the conclusion that the surest route to long-term healthy eating is consuming in the main fresh home-cooked food – where you know how much of which ingredients of what nutritious quality you’re consuming. The trouble is that if you have a busy working life then unless you make a concerted effort to plan your meals in advance (perhaps taking time at weekends or when less busy to shop for the necessary ingredients and prepare batches of meals for freezing so they are ready for you to eat when you have less time in the week) it’s difficult to maintain a healthy diet – either for weight loss or to maintain the weight and health you’re happy with. Well, the chances are that somebody near you will have a different work-life balance and be able to prepare home-cooked food for those times when you’re not. Hence, if you want to find somebody who can prepare chow for you or someone who’d like to chow down on your food just post a reply here. Of course you’ll need to agree the commercial arrangements between yourselves to make the exchange worth both your whiles. This will include details of the ingredients used (e.g. 2% fat minced beef is more expensive than ‘value’ 20% fat), when the meal(s) will be collected/delivered and when/how payment will be made. All parties should satisfy themselves that adequate standards of hygiene are followed and chow makers are responsible for declaring any profits they make. the first part of your postcode – not the full postcode for data protection. Anyone interested in finding a chow ‘partner’ can just type in the first part of their postcode (e.g. SW20 or even just SW) in the search box that you’ll find in the top right corner of this page and make direct contact with prospective partners. GI Chow cannot endorse or warrant replies or be held liable for any losses resulting from individuals entering into private transactions, however reserves the right to remove replies where complaints about those replies supported by evidence are made known to us.